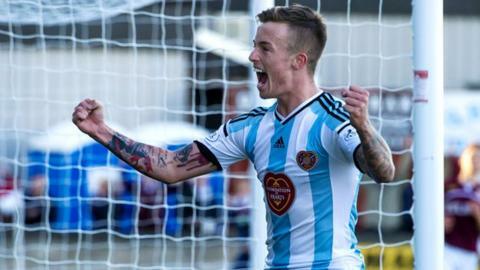 Championship leaders Hearts continued their bright start to the season with a League Cup win at Stenhousemuir. But victory came at a cost as both Jordan McGhee and James Keatings were forced off in the first half. David Smith surged down the right and crossed for the unmarked Gary Oliver to fire home in the sixth minute. Kevin McHattie found the bottom corner with a shot before Kieran Miller pulled one back for the Warriors before the half-time interval. Miller's goal was set up by nice chest control from Martin Grehan, while McHattie's strike was set up by Jamie Walker. Both sides had further chances to score in an entertaining second period, with substitute Osman Sow going closest for Hearts with a header against the crossbar from a corne. Match ends, Stenhousemuir 1, Hearts 2. Second Half ends, Stenhousemuir 1, Hearts 2. Corner, Hearts. Conceded by Alan Lithgow. Jamie Walker (Hearts) wins a free kick in the attacking half. Attempt missed. Osman Sow (Hearts) right footed shot from outside the box is too high. Substitution, Hearts. Adam Eckersley replaces Kevin McHattie. Kevin McHattie (Hearts) wins a free kick in the defensive half. Jason Holt (Hearts) wins a free kick in the attacking half. Martin Grehan (Stenhousemuir) is shown the yellow card. Corner, Hearts. Conceded by Ciaran Summers. Attempt missed. Jamie Walker (Hearts) right footed shot from the centre of the box is too high. Stewart Greacen (Stenhousemuir) wins a free kick in the defensive half. Foul by Osman Sow (Hearts). Foul by Liam Smith (Hearts). Substitution, Stenhousemuir. John Sludden replaces Kieran Millar. Colin McMenamin (Stenhousemuir) wins a free kick on the right wing. Attempt saved. Osman Sow (Hearts) left footed shot from the left side of the box is saved in the centre of the goal. Foul by Jamie Walker (Hearts). Attempt saved. Jamie Walker (Hearts) right footed shot from the centre of the box is saved in the centre of the goal. Kevin McHattie (Hearts) wins a free kick on the right wing. Osman Sow (Hearts) hits the bar with a header from very close range. Corner, Hearts. Conceded by Greg Fleming. Attempt saved. Gary Oliver (Hearts) right footed shot from the centre of the box is saved in the bottom right corner. Attempt blocked. Osman Sow (Hearts) right footed shot from the centre of the box is blocked. Jason Holt (Hearts) wins a free kick on the right wing. Colin McMenamin (Stenhousemuir) is shown the yellow card. Kevin McHattie (Hearts) is shown the yellow card.